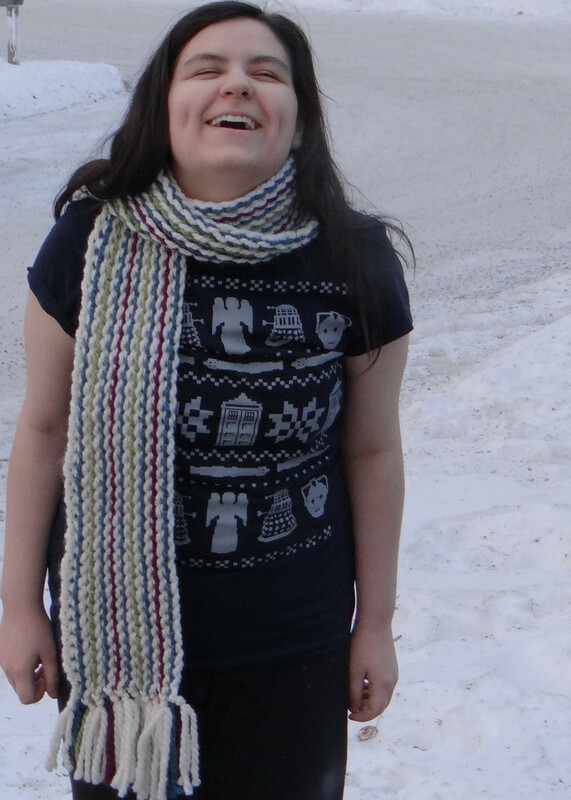 Scarf modeled by the Amazing Turnip Girl. Slip stitch crochet fabric, also called Bosnian crochet creates a very fluid fabric when worked in only one loop that has a lot of stretch. A lot of crocheters avoid it because slip stitch crochet works up so slowly. This scarf works up really quickly showing off the thinner stripes of color you get with slip stitch because it's done in a super bulky yarn with a size Q hook. You can find Q hooks at most craft stores. Look for Boye's Crochet Dude line for a set that includes 3 bigger hooks. The Q will be the big plastic one in the middle. The yarn I picked is Michaels Loops and Threads Cozy Wool yarn. It's a 50/50 wool/acrylic blend. This will work with any bulky yarn. I chose the Cozy Wool because it's not as heavy as pure wool, but still has enough wool to be very warm for Alaskan winters! It took just a bit more than one ball of the Fleece, so there was leftovers in all the colors. My daughter loves the yarn and will be working with the leftovers and some balls she picked up for herself and will probably knit a horizontally striped scarf with them. You could absolutely do this using worsted weight yarn and a smaller hook. It will take a lot longer, and you'll need to add more rows. Make a slip knot with a loop to start, leave an end longer than you want the fringe to be. With Fleece (cream)- chain 100 stitches loosely. If you want a longer scarf, chain 120 stitches. On the first stitch, place a stitch marker to mark that end of the scarf. I just used a scrap of yarn and tied it into a open loop to cut out later. All Fleece colored rows start on this end. The colored rows start on the other end. Row 1: Make a slip knot loop with the Thunder (blue) leaving a tail for fringe and put loop on hook. Slip stitch in each stitch working in front loops only. Break off yarn leaving enough yarn for fringe. Row 2: Fleece row, slip knot loop with an end for fringe, put loop on hook, slip stitch in front loops only, break off leaving end for fringe. Row 3: Sweet Grass (green) row- Work as for Row 1. Row 4: Fleece- Repeat Row 2. Row 5: Thunder- Work as for Row 1. Row 6: Fleece- Repeat Row 2. Row 8: Fleece- Repeat Row 2. Row 9: Thunder- Work as for Row 1. Row 10: Fleece- Repeat Row 2. Row 11: Sweet Grass- Work as for Row 1. Row 12: Fleece- Repeat Row 2. Row 13: Thunder- Work as for Row 1. Row 14: Fleece- Repeat Row 2. Row 16: Fleece- Repeat Row 2. Row 17: Thunder- Work as for Row 1. Row 18: Fleece- Repeat Row 2. Cut yarn for fringe, 20 pieces of cream double the length of the fringe you want plus 3 inches for knotting. 4 pieces each of purple and green, and 10 pieces of blue. Pull each strand of yarn through the beginning and ending stitches to match the rows. Tie the ends of the yarn from the crocheting and the fringe pieces in overhand knots with 3 strands each close to the ending and beginning of the rows. The stripes can be arranged in other ways. I chose a analogous color scheme with Fleece as a neutral stripe between each color stripe that looked like this. But you could also do less stripes for a good scarf for a fairly conventional man working in a neutral and a color or even two neutrals. For my husband, it would be grey and green. Green is his favorite color and he prefers grey to black. I love the pattern... Thanks for sharing. ~ Crocheting a scarf is also a good way to relieve stress. I love Avocados from Mexico!